If you’ve never made a mixtape for yourself or someone that you care about, you simply haven’t lived. The idea of crafting a selection of music, slapping a label on a tape and handing it over to someone was one of the best feelings ever. Sure, we’ve replaced that phenomenon with services like Spotify, which let you create and share playlists of music, but the physical mixtape is something that I miss. 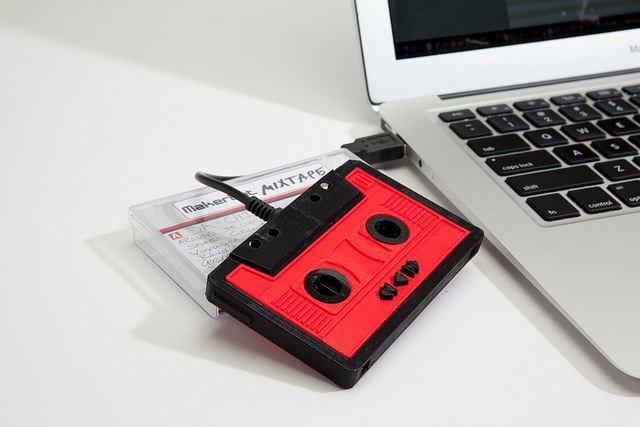 Luckily, the geniuses at MakerBot have been working on a project to bring the mixtape back. We just released this in our store this morning and we’re already getting a great response. Let’s face it, being able to #make something that we all thought was extinct is awesome. This Mixtape is updated for modern times and ready for you to drag and drop your favorite mix for that special someone. Just plug it into your computer with the USB cord and then drop awesome songs onto it for that hot guy or gal you want to impress. Go get yours like right now. The version that is pre-assembled will only run you $39. This will go nicely with my brand new Walkman.